Do you generally enjoy customer service calls? Do you do well working quickly and under pressure? Well, then CenturyLink might be the right work-at-home (WAH) opportunity for you. CenturyLink is a Fortune 500 telecommunications service. This company provides telephone, high-speed Internet, wireless Internet, and online television services through a high-quality fiber optic network. Headquartered in Monroe, Louisiana it is also recognized as a global leader in cloud infrastructure and hosted IT solutions for businesses of all sizes. What Types of Jobs Are Available at CenturyLink? Outside of the regular “cable guy” jobs, CenturyLink also offers jobs in marketing, sales, human resources, finance, and legal. Like any large corporation, it will have departments and managers at all levels in these departments. This article will discuss the WAH position of at-home customer service agent. The work-at-home customer service position is between 16 to 29 hours per week. Your hours will be based on the location you serve as well as how many hours you want. CenturyLink claims to expect a lot from its remote customer service agents, but then strives to create a fun and supportive environment. They expect a high-level of commitment and professionalism as well as a consistently positive attitude. Alabama, Arizona, Colorado, Florida, Georgia, Illinois, Indiana, Kansas, Louisiana, Michigan, Minnesota, Missouri, Mississippi, Montana, North Carolina, Nebraska, New Jersey, Nevada, New Mexico, Ohio, Oregon, Pennsylvania, South Carolina, Tennessee, Texas, Virginia, West Virginia, Wisconsin, and Wyoming. You also must be in one of the CenturyLink-served areas of your state. In other words, if you are in a rural area, which does not offer CenturyLink services, then you will not be able to work there. For a full list of jobs, go to the career page at CenturyLink. You can also view jobs on your mobile phone, but you will need to fill out the job search information first. What is the WAH Customer Service Position Like at CenturyLink? 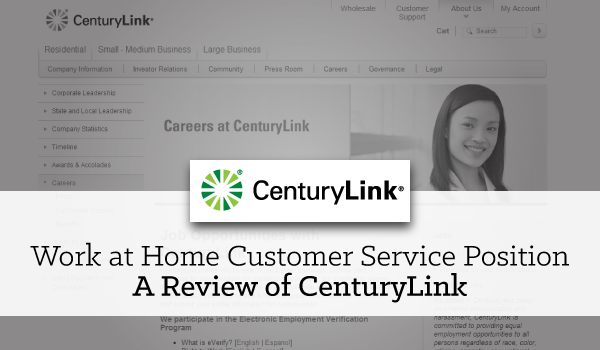 The CenturyLink WAH customer service position will be assisting those customers who call in and have a problem with their service. It could be anything from a modem not working to a fax machine unable to accept incoming faxes. The agent will try to ask the necessary questions to help resolve the problem and in some instances dispatch a technician to the home or business. While this position is labeled “customer service”, there is limited selling. This selling would be mentioning an upgrade, special promotion or “bundle” (multiple services rolled into one) to the customer. What Are the Hours for the WAH Position at CenturyLink? For a complete list of skills you that you may test yourself with visit CenturyLink’s List of Tests — be willing to test for as many skills as you want AFTER you have applied to CenturyLink. The website no longer allows you to click on the individual skills and see what the requirements are or what to do to prepare for the test. Nevertheless, it does give you an idea of what types of testing will be given. What Types of Equipment is Needed? an updated PC or laptop. a landline phone service via CenturyLink. a headset with mic bought through CenturyLink. While the web site really doesn’t provide much information about its careers, I have spoken to those who have worked there and/or are currently working there in this remote customer service agent position. The headset must be purchased through CenturyLink even if you already have one. In other words, you must use their headset and have your high-speed Internet and phone service provided by CenturyLink. Like most remote call centers, calls are recorded for quality assurance (QA) and training purposes. Also, should there be an ongoing problem with a customer, there would be a recorded “log” of the situation. What is the Training Like at CenturyLink? Training will be paid at whatever rate was agreed upon at your interview for your area and experience. If eligible, there may also be a $500 bonus after 30 days. Independent Contractor or Employee with Benefits? The customer service position mentioned is a part-time employee position that you may only apply for on their web site. There are paid vacations and paid holidays for this part-time WAH position. What is the Pay Scale at CenturyLink and When is Payday? Pay starts around $10.50 and hour but can quickly go to $12.00 an hour with bonuses and incentives. There will also be performance raises and bonuses as time continues. Payday appears to be every two weeks via check or direct deposit. As previously mentioned, there will be a $500 bonus after the first 30 days if all of the requirements have been met. What is My Overall Impression of CenturyLink? CenturyLink is my own landline phone service provider, so I know that it is a legitimate company. From what I am hearing, I think it does provide good benefits and pay for a part-time remote agent position. How Can an Interested Applicant Apply to CenturyLink? All potential applicants can go to the Careers Page to create a jobseeker’s account and receive alerts via email or text. I actually worked for Centurylink, from home, as a home repair tech. It was a rough work situation. Lots of expectations on their part, little support given. It didn’t help my chronic pain issues either so I resigned after working for them for a year. It’s good pay for a work at home job that will require a lot from you. Be prepared. Thanks, Rona for the feedback. I understand they DO expect a lot. I don’t think the WAH home repair tech position is currently open, but nice to know about your experience. You’re welcome. Despite the fact that I’m no longer working I still enjoy reading your blog. @ Jessica, thank you! Yes, there are legit companies of all kinds out there. It is just finding them and wading through all the “bad guy scammers” out there! But thank you for that link. I would like to apply for work from home position (Customer service) in Orlando Fl. Where do I apply? I searched on website and did not see where.